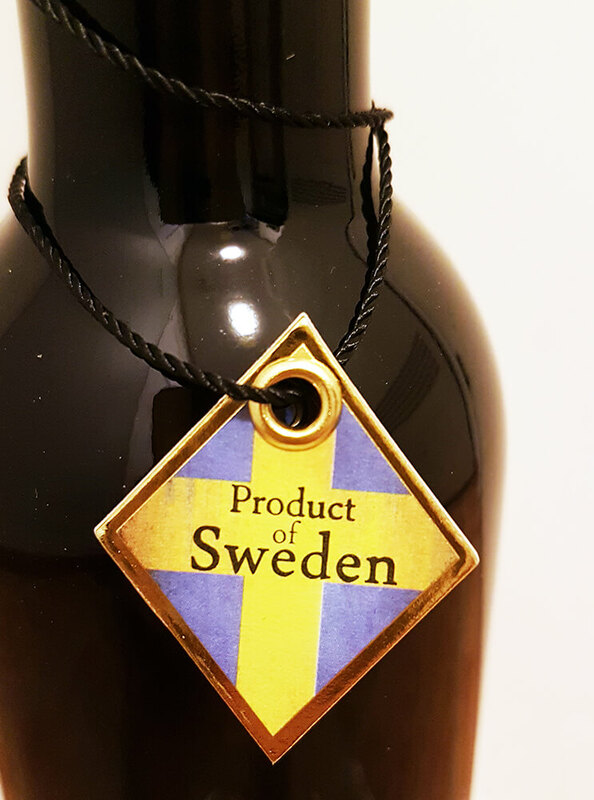 From the famed Swedish distillery, which was actually the first Swedish absinthe distillery in modern times, Valkyria Distillery (formerly Sankta Anna Bränneri) comes this intriguing creation. 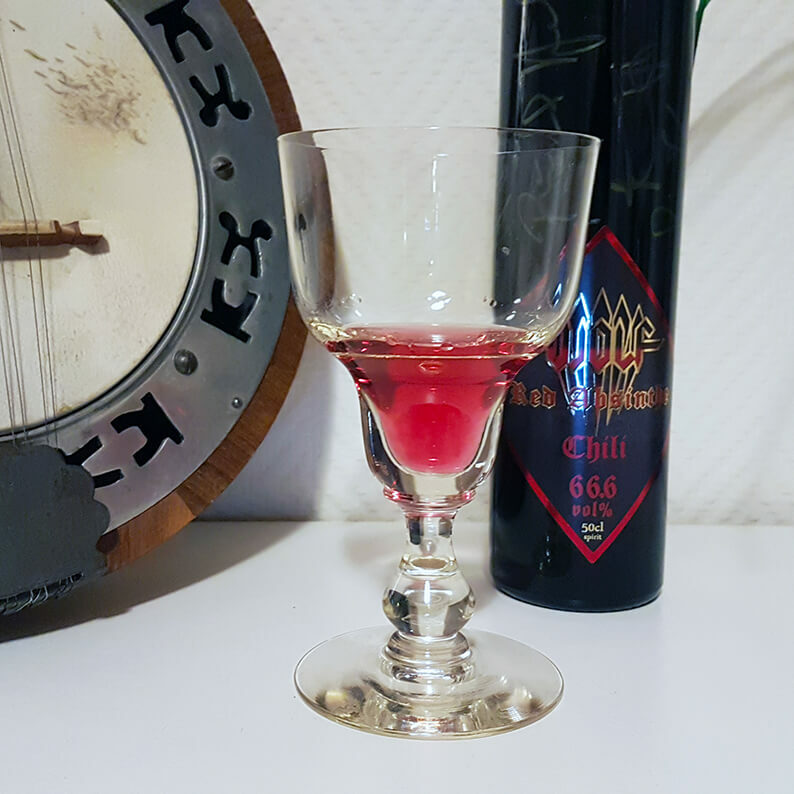 Following the success of the Wolf absinthe, this spiced up red absinthe is sure to bring the heat on. But is it hot enough? 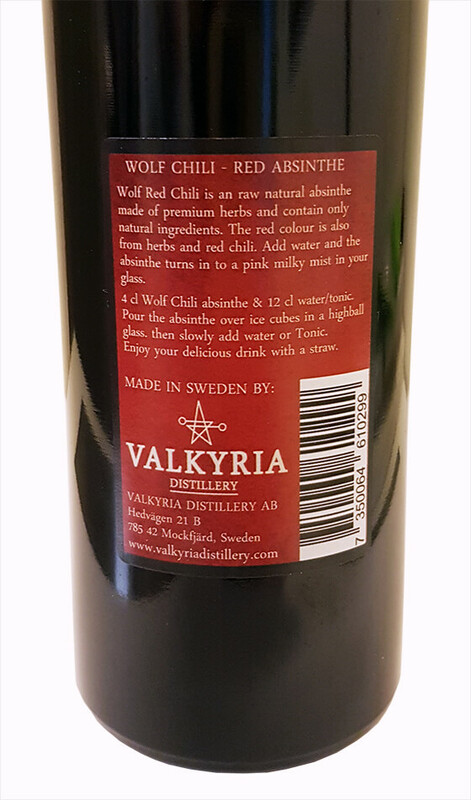 Wolf Red Absinthe Chili from Swedish Valkyria Distillery AB - the artist formerly known as Sankta Anna Bränneri is an absithe rouge made for and in co-operation with the Swedish rock band Wolf. Every bottle is signed by the band, at the distillery. The bottle is the same classic tall half liter bottle as many others use these days. It still looks very good though with a nicely designed label with red metallic details popping out. 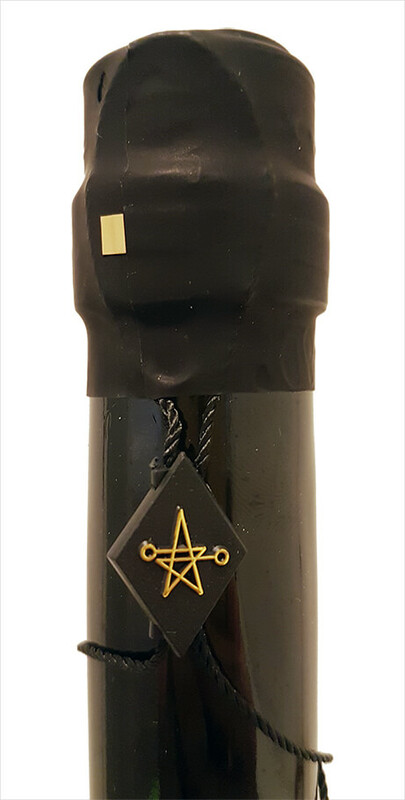 Around the neck, hanging from a lace, is a label stating this is a Swedish made absinthe. Nice. Opening the bottle, which uses a plastic and rubber t-cork, the Wolf Red starts to reveal itself. Slowly. Pouring it in my glass it shows itself in a bright distinct and beautiful blood red. Clearly without any form of artificial additives. Of course, the question is how this red will hold up in the long run, but now - while it's new - it is absolutely beautiful. Completely clear and super pretty. I did taste this neat prior to louching, and at first it presented a nice smooth taste from the anise and fennel with just a faint hint of wormwood, but strong from alcohol. A fraction of a second later the spicy heat comes. The chili is very noticeable but balanced just well enough not to be too hot. This takes away the alcohol bite and suddenly the anise and fennel show up again as background dancers. The aroma before adding water is quite interesting - and I mean that in a good way. 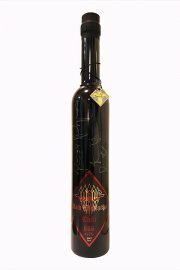 It starts out as just about any other well made absinthe but rather quickly the anise and fennel is toned down by something else. Something a little fruity, but hot. The wormwood is definitely present and mixes very well with this strange fruity spiciness. Not surprisingly with hot chili characteristics. Go figure. I added ice cold water using a glass brouilleur which slowly, drop by drop, produced a nice and steady louche. 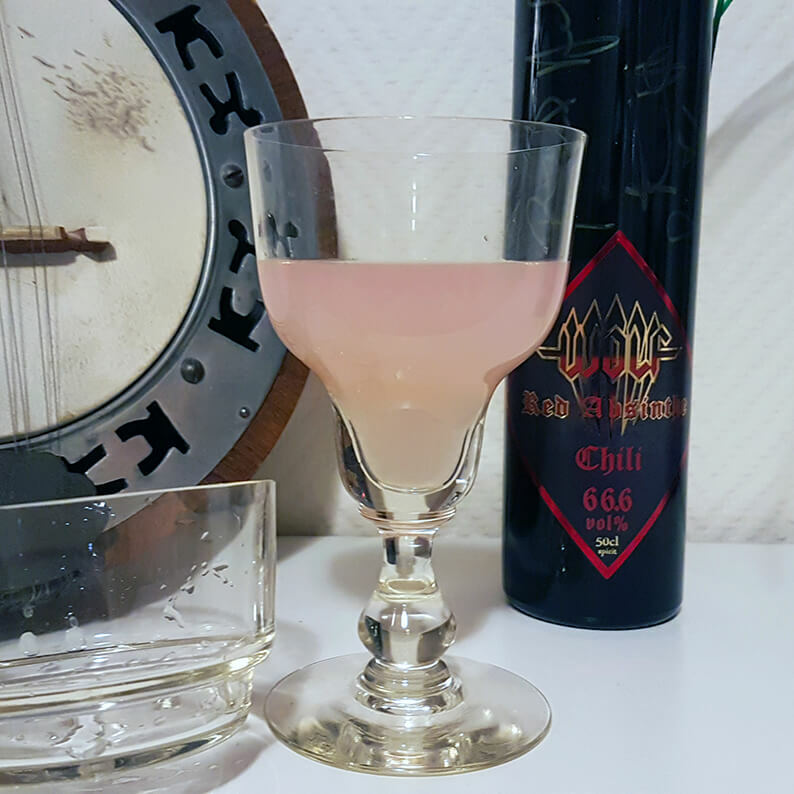 It wasn't dramatic in any way but builds up nicely and turns the Wolf Red Absinthe Chili into a really pretty pink glass of spiciness. Of course, being a red absinthe I will have to compare it to other red absinthes and in that category this is definitely one of the best I've seen. The clear beautiful red turned into a nice completely opaque pink without being too much. It doesn't turn into a fluffy cupcake unicorn. After adding water the aroma mellows a bit and the scents marry together to form almost a licorice profile but without the sweetness. I wouldn't immediately call out chili in there but it does add some oomph to the overall profile. The only thing I'm kind of missing here is just a little bit more of the traditional absinthe showing itself. But that is just my personal opinion, and to be perfectly honest - maybe that would destroy the character of this drink... So, I won't be complaining about that. So, finally - let's taste this beast! This is where this absinthe is very interesting. It gives a super smooth and well balanced mouth feel in many aspects but it's still all over the place in some strange way. And again, in a good way. The Wolf Red Absinthe Chili certainly plays with your senses... The smoothness of a well made absinthe gets kicked in the nuts by that hot spicy chili profile, only to forgive it and start making love to it. Hot steamy spicy love. It leaves a wonderful fire-y sensation and warms your throat nicely. Perfect for winter! What about the taste? Well, watered down and perfectly louched, the alcohol is of course less obvious and the background dancers form a full group with wormwood tagging along. Again though - the chili just somersaults its way on stage to take the front row. In an instant it all turns from a classic absinthe to a red hot rock and roll stage dive. I love it. It's so unexpected - and I love it. Again, there is but one thing I personally would like and that would be for the holy trinity to get just a little more of the spotlight. I still love it though! Wrapping things up all I can say is that I'm not easily impressed these days. I've had more than my fair share of absinthes over the last 20 years and I've seen them all. The highs and the lows and the weird things on the sides. This one, however, actually managed to both surprise and impress me. I am a big fan of spicy food, I mean - spicy food. The heat that this baby packs is right up my alley and with a very well made absinthe as it's base the chili adds just that special something that makes me smile. I needed this. It may not be the best absinthe I've ever had but there are so many things about this that just makes me like it a whole lot. Then again, it's not supposed to be another "ordinary absinthe", and it does a damn fine job at that.